"Remember when the scholars said the Taken wouldn't be any trouble once we killed the King? Maybe they should grab a weapon and come out here." Sekrion, Subverted Mind is a Taken Hydra that can spawn as the final boss of The Nexus: Revisited Strike. As with any Taken Hydra, Sekrion will have no shield by default, leaving it vulnerable to attack. Just like its Vex counterpart, it will stay in the center of the arena and open fire on Guardians using its Aeon Maul. 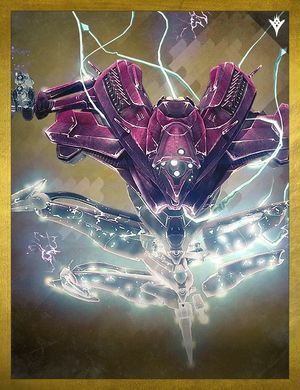 However, every so often, Sekrion will activate a barrier around itself that can only be taken down by the Super attack of the Aegis shield relic from the Vault of Glass, which will spawn in different spots along the edge of this arena. Applying the same mechanic used during the Templar encounter from the Vault of Glass, one player must pick up the Aegis shield to begin charging the relic's super, then blast Sekrion's barrier once it's at full charge. This will deactivate Sekrion's barrier, initiating a damage phase. The Aegis will immediately despawn from the players hands after each use and respawn in another random spot along the outer ring of the arena. Players will need to coordinate Aegis blasts and damage phases while maintaining control over waves of "lesser" enemies to put an end to Sekrion. As always, rinse and repeat. Its appearance is essentially the same as the Seditious Mind. Sekrion, Subverted Mind is the second strike boss to replace the usual encounter, which is the vex counterpart.